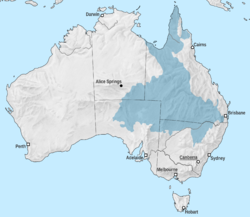 The Great Artesian Basin is the largest and deepest aquifer (artesian basin; an underground layer which holds water under pressure) in the world. It stretches over 1,711,000 square kilometres (661,000 sq mi), with measured temperatures ranging from 30°C to 100°C. It underlies 23% of Australia, including most of Queensland, the south-east corner of the Northern Territory, the north-east part of South Australia, and northern New South Wales. The basin is 3,000 metres (9,800 ft) deep in places and is estimated to contain 64,900 cubic kilometres (15,600 cu mi) of groundwater (water in the soil, below ground level). The basin provides the only reliable source of freshwater (water that does not have much salt in it) through much of inland Australia. The Great Artesian Basin Coordinating Committee (GABCC) coordinates activity between the various levels of government and community organisations. The water of the GAB is held in a sandstone layer laid down by continental erosion of higher ground during the Triassic, Jurassic, and Lower Cretaceous periods. During a time when much of what is now inland Australia was below sea level, the sandstone was then covered by a layer of marine sedimentary rock shortly afterwards, which formed a confining layer - thus trapping water in the sandstone aquifer. The eastern edge of the basin was uplifted when the Great Dividing Range formed. The other side was created from the landforms of the Central Eastern Lowlands and the Great Western Plateau to the west. Most recharge water enters the rock formations from relatively high ground near the eastern edge of the basin (in Queensland and New South Wales) and very gradually flows towards the south and west. A much smaller amount enters along the western margin in arid central Australia, flowing to the south and east. Because the sandstones are permeable, water gradually makes its way through the pores between the sand grains, flowing at a rate of one to five metres per year. Discharge water eventually exits through a number of springs and seeps, mostly in the southern part of the basin. The age of the groundwater is got by measuring carbon-14 and chlorine-36. It ranges from several thousand years for the recharge areas in the north to nearly 2 million years in the south-western discharge zones. ↑ 1.0 1.1 Spanevello M.D. 2001. The phylogeny of prokaryotes associated with Australia's Great Artesian Basin. Griffith University PhD dissertation. Accessed 2009-07-26. ↑ 2.0 2.1 "Underground water factsheets: Great Artesian Basin" (PDF). Department of Environment and Resource Management. Retrieved 30 September 2010. ↑ Mudd, G.M. 2000. "Mound springs of the Great Artesian Basin in South Australia: a case study from Olympic Dam". Environmental Geology (Springer Berlin / Heidelberg) 39 (5). doi:10.1007/s002540050452. http://www.springerlink.com/content/2nf4ncwxrgeyvcep/. This page was last changed on 19 April 2016, at 02:04.